In the past two years I have become very enthusiastic about bicycling. Now I ride 5 or 6 days most weeks, covering distances of between 45 and 170 kilometres each day. I ride for pleasure, but also set myself challenges to go further and faster, and even have a couple of ambitious targets for the longer term. Mostly I ride alone, but occasionally I ride with friends I have made through chance meetings on the road. Now I am also competing in occasional races. 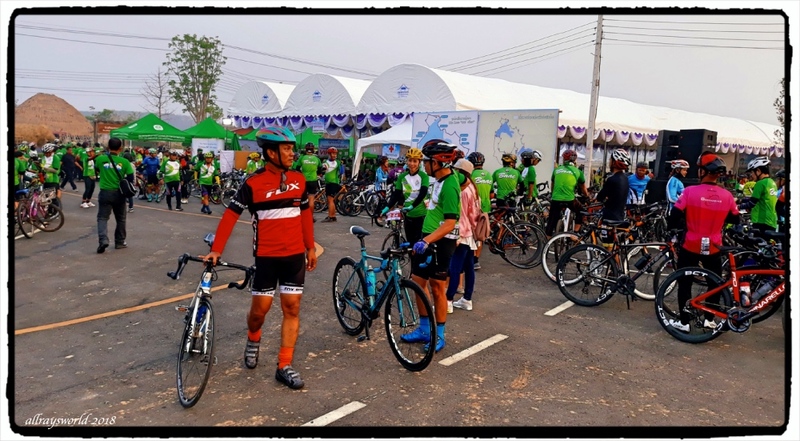 These pics are from a recent 65km race where I got to compete against some of Thailand's best road cyclists. The top image illustrates my lack of experience in racing...I towed this group of riders [all much younger than me] for up to 40 km with none of them prepared to offer me a spell at the front so they were all cruising along with about 30% less effort than me. No matter...I am enjoying the challenges and the learning. Je vois que tu affectionnes particulièrement les courses de vélos. Ray: Oh oui ... le vélo est amusant, et la course cycliste est encore plus amusante! I admire you because you never stop learning. This bike racing lark will toughen you up, or ensure your heroic demise..
Ray: So much still to learn and experience, Chris, and time is getting short! Ha Ha...yes, my end could make the Sports Blogs! Bravo ..jusqu'a 170 kms jour ..wouah !! Ray: Je pense que je pourrais faire du cyclotourisme sur de longues distances quand j'ai 75 ans, Claudine. There is a lot oft tactics to cycle racing, a sport I enjoy watching on TV through the summer. I often reflect that when imwas a young man it is a sport I might have enjoyed taking part in, now, unlike you, I'm too old and unfit! I like the look of utter concentration. Ray: I am standing up on the pedals, Mary...about to make yet another effort to power away from these free-riders...in this position it is entirely possible I will lose my balance and fall over, as my bicycle handling skills are laughable...concentration is essential! Something psychological about being in first place... I think. Congratulations to you, Ray - an amazing accomplishment at any age! Ray: I am enjoying the challenges of racing, Elizabeth...a great opportunity for learning!